My friend Ms. Phonetic, a Texan girl born and bred, often laments the lack of good Mexican, never mind Tex-mex, available here in Sydney. When we were sharing a house back in the day, I remember her half-baked plans for tortilla stands, burrito buses and importing Mexican beer. More recently, I witnessed her untamed joy as we walked through Fiji Market on King Street, Newtown and came a across tins of Chipotles in adobo, Mexican hot chocolate, hominy and a plethora of Mexican sauces. In recent years Australia has seen a lot of Mexican grill franchises popping up (Guzman y Gomez, Mad Mex and the like). Generally, these places will use large flour tortillas to wrap a burrito filled with your choice of grilled meat, rice, refried or black beans and various salsas, sauces, sour cream and always ALWAYS charge extra for guacamole. Ms. Phonetic maintains that they’re twice the price and nothing like the real thing. Debates about authenticity aside, I’ll have to take her word for it. I guess nothing beats a freshly made tortilla or a fresh batch of Mexican rice or real queso dip. So, having only my experiences eating at lost-in-translation burrito franchises to go on, I worked to duplicate something of what I had tasted. I scoured the internet for ‘Mexican Rice’ recipes. This recipe is really easy and delicious, all I’ve done is added more spices and extra garlic. My favourite way of serving this is as part of a burrito, which I’ll outline in my next post, but it’s also an amazing side dish. I’ve yet to mix up a batch for Ms. Phonetic but when I do, I’ll let you know how it goes. Heat the oil in a small pan to medium high. Sauté the jalapeños, garlic, and onion for a couple of minutes. Add rice and spices and toast a couple more minutes. 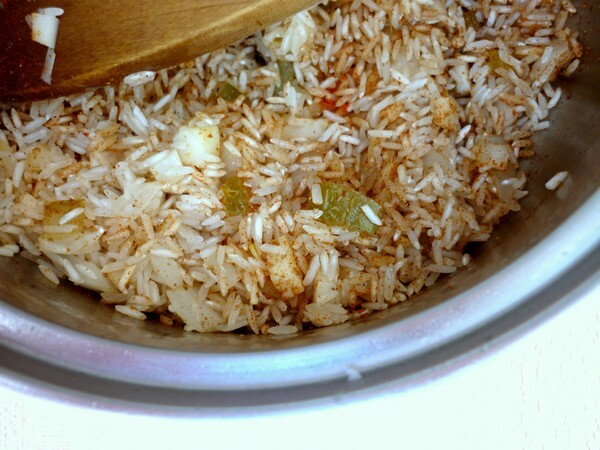 When the rice begins to ‘pop’, quickly stir through the tomato paste. Add the stock and water and stir through. Put the lid on and turn the heat as low as it goes. 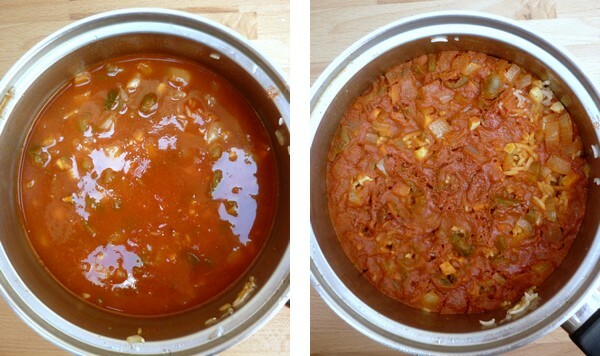 Simmer 15 to 20 minutes. Burning the bottom of the rice a little is encouraged. I generally turn off the heat after 15 minutes and just let the rice sit for 5 to 10 minutes. Serve with black beans or chicken or in a burrito. I know it looks ugly, but trust me. It’s delicious.